In an effort to bring transparency and fairness to the matter, we will feature information in future posts spotlighting the person’s involved. We hope that you’ll weed through it all to make an informed decision about this case. Today we’d like to bring you the birth mother in her own words. Q. And the truth is he had no idea you intended to adopt this child, did he? Q. And the first time my client had learned that you had put his child up for adoption was when he was served with the action in January of 2010. Isn’t that true? A. I don’t know when he found out. Q. And the Nightlight, in the Exhibit 4, you also state that my client is a Cherokee, you know he’s a registered member of the Tribe. That’s never been — you always knew that, didn’t you? A. That I’m aware of, yeah. Q. You told everybody, every agency involved, this child’s father is an Indian. He’s a member of the Cherokee Indian Nation? Q. And you knew when you were pregnant or tell me when you knew that my client was going to be deployed to Iraq. A. Well, I had always known that sooner or later he was going to be. Now, whenever he found the date out, I don’t remember. Q. You also didn’t know how to spell your fiance’s name? A. No, I know how to spell it. when in fact he spells Dusten with an E. Isn’t that true? http://hidemyass.com/files/3Hw4L/ from “Carli Sthree” posted on the Haley Hernandez Facebook page. On Dec. 31, 2011, Baby Girl was transferred to the physical custody of Dusten Brown per the South Carolina family court’s order. Much speculation surrounds the details of that transfer. The adoptive couple’s supporters maintain that no warning was given, Mr. Brown simply swooped in in some truck, with no transition plan and stole her. She was a confused, crying child given up to strangers and shuttled across the country. She’d be sure to be upset and psychologically damaged. It was all done so quickly and under the cover of darkness. They had no chance to prepare. S.C. proceedings however indicate in fact, they were given time to prepare. A ruling issued earlier that fall stated that courts had ruled in favor of Mr. Brown and a transfer was imminent. The Capobianco’s, in the very same manner for which they now criticize the biological father, attempted to fight the ruling by filing for a stay. This was a legal gamble on their part, one they should have been aware could cost them further time with the child if they didn’t win. It seems that continued litigation and legal foot dragging caused the courts to take a firm stand and order the immediate transfer of the child with less than 24 hrs. notice. Supporters also firmly stand by their statements that no advance notice was given and that media outlets and protesters showed up that night in a rather organic, unorganized fashion, drawn there to bear witness by their broken hearts. Pages were set up to support the Capobianco’s in their efforts to get her back but supporters insist this wasn’t done until after the transfer and no one from their side asked for any persons or media to show as that would have been further damaging to Veronica. Media reports though from the time give us a different view and further insight into the transfer. In an article by the Charleston City Paper, one is given the picture of a distraught couple, standing among the debris left behind by New Year’s Eve revelers, empty handed and tearful in the darkness of night. And in what would appear to be in direct conflict with supporters claims, Trio Solutions, the company of friend and spokesperson Jessica Munday, issued the following statement in advance of the transfer calling for anyone and everyone to show even if they didn’t personally know this family. Post from Trio Solutions asking that supporters show up in force to support. However,video and their own reporting show, Mr. Brown arrived as directed at the designated time and place. He was later forced to relocate the child and move the transfer to his attorney’s office. 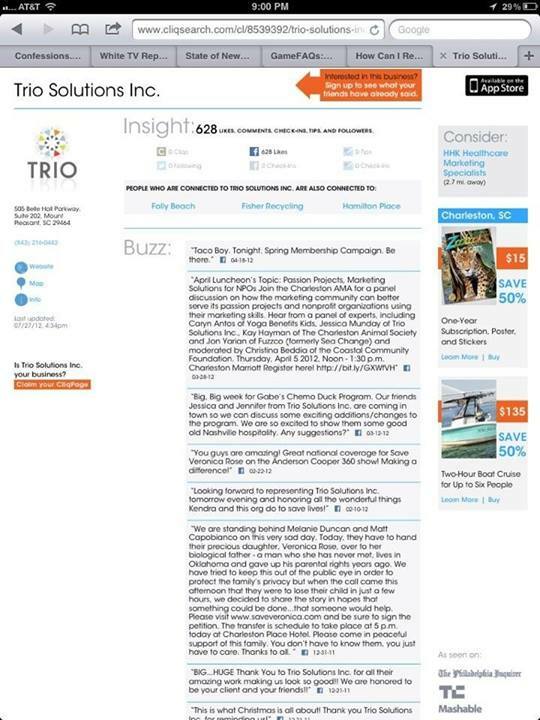 The media at the behest of Trio Solutions had created a detrimental situation for the child. Brown’s attorney’s were forced to try to wait out the crowds apparently but in an attempt to thwart their efforts in keeping this as peaceful as possible, reporters staked the location out, waiting for Brown to appear well after dark. While he tried to load everything into the truck, reporters and supporters for the Capobianco’s continued to harass and surround him sticking cameras and microphones into his face while he held Veronica in his arms. On the sidelines, Matt and Melanie Capobianco continued to give local news stations interviews. Video of the transfer can be seen here. Oklahoma, 2008, Dusten Brown and Christina Maldonado are in a relationship. He’s proposed and they intend to marry, although it would seem the feelings are much stronger on his part. Shortly after becoming pregnant, Miss Maldonado informs him of the pregnancy and of her intent to call off the relationship. The best one can ascertain given the facts is that Miss Maldonado isn’t smitten with the idea of marriage and the couple have fought repeatedly. They’ve said things to one another that were less than amicable. According to court documents, Miss Maldonado and Mr. Brown had several exchanges via text message. Finally, in the heat of an argument, in response to her repeated prodding, Mr. Brown texted back indicating he would ‘give up his rights’ to their child. However, court documents also show there is much more to this story than meets the eye, much more than has been reported from either side thus far. The following is the story of how the case of Adoptive Couple V. Baby Girl began as taken from various court records. Veronica was born in Sept., 2009 in Washington County, Oklahoma. Records indicate the couple lived together but that Brown’s absence due to military service and Maldonado’s change of heart are what terminated their cohabitation and pending nuptials…the modern day version of the ‘Dear John’ letter. At that time, Mr. Brown was assigned to training in the U.S. military stationed in Ft. Sill, Oklahoma (approximately 4 hrs. from his home in Bartlesville). Records state “PRIOR TO THE BIRTH OF THE CHILD (MALDONADO) COMPLETELY CUT OFF ALL COMMUNICATION WITH (BROWN). (MALDONADO) REFUSED TO TELL (BROWN) WHEN THE CHILD WAS BORN AND KEPT THE CHILD’S WHEREABOUTS A SECRET FROM (BROWN). …THE DAY AFTER THE BIRTH THE CHILD WAS TRANSPORTED TO SOUTH CAROLINA. MATTHEW AND MELANIE, LAST NAME UNKNOWN, FILED A COMPLAINT FOR ADOPTION IN CHARLESTON COUNTY, SOUTH CAROLINA FAMILY COURT ON SEPT. 18, 2009.” Maldonado denied Brown the opportunity to participate in the birth and to contribute towards expenses and support. He didn’t know where his child was since her birth. Initially, Matt and Melanie Capobianco were allowed to remain anonymous in court documents, referred to only as “MATTHEW AND MELANIE, last name unknown.” Brown, according to Maldonado’s own admission, having no knowledge of the adoption because she wouldn’t take his calls or visits, had no idea if his child was with Maldonado or not. He could only assume she was but never once thought she’d been given for adoption to a couple a thousand miles away. In fact, in court transcripts for some time, Brown referred to his infant daughter as Victoria, indicating not only was he not aware of her birth but that he wasn’t even told her name. While remaining anonymous and not wishing to give him any more information about them than he already knew, they too referred to her as ‘Victoria’ and didn’t bother to correct birth father. Maldonado also referred to Veronica as ‘Victoria’ in proceedings, conspiring with the adoptive couple. Records also indicate the document he was presented with was confusing. He was under a lot of stress pending his deployment with a lot of tasks to complete before that date. He had no attorney to advise him. The documents never mentioned he had a right to an attorney or a choice to not sign. He had no idea what his signature on the document would mean. It was never notarized or verified and at no point did Brown sign away his parental rights. (The record stresses he never appeared in any court to relinquish his rights nor had any court terminated his rights so as to point out that not only did those documents not terminate his parental rights but neither could text messages.) He simply signed an ‘acceptance of service’. Having been served on Wed., January 6th with those documents, Brown wasted no time in consulting with not only his commander and the JAG division of the military, but he also hired an attorney by Friday the 8th. Given it was the weekend, the attorney called the South Carolina courts and the couple’s attorney at the first opportunity and followed that up with a formal letter stating Brown was revoking his signature on the documents. Despite having received this information both verbally and officially in writing, the adoptive couple’s attorney went on to file these documents with the South Carolina courts giving the impression that father was in fact willing to give his blessing to their adoption. By January 14th, 8 days after being notified not only that his daughter existed, was born and had also been shuffled off to South Carolina, and with deployment looming, he filed in Oklahoma courts to establish paternity and obtain custody of his daughter. Records also indicate that as of Jan. 14th, 2010, Dusten was still in Comanche County, Oklahoma (stationed at Ft. Sill). He’d been fighting from afar without access to all the records, documents and resources that he’d have had at home and was waging his defense in between training exercises. In hiring his attorney in his hometown of Bartlesville, he’d have to rely on brief telephone conversations to convey his story and faxing documents back and forth. It can be assumed that he was probably rushed and under stress. Records show he forgot to tell her or that she was unaware that he was Native American initially and that information was not included in documents. In fact, documents instead relied on Maldonado’s information on ICPC forms stating this was not a matter concerning Native American heritage. The Indian Child Welfare Act, for this reason, had not yet come into play. The legal battle for Veronica has so far landed in Oklahoma courts, SC Family Courts, the South Carolina Supreme Court, the Supreme Court of the United States and the Cherokee Nation Tribal Courts and continues today in what’s become a tug of war. The hearings continue to focus on various details of their story. Was Brown a deadbeat? Was Maldonado acting out of spite? The case also involves the Indian Child Welfare Act. Jurisdiction has become an issue akin to trying to nail jello to a tree. The Capobiancos and their supporters maintain Brown made no attempt to be a father to his child and that they’ve raised Veronica for the first two years of her life. They insist they are her rightful parents. Brown and his wife, Robin, assert that the child was in essence stolen from Brown through deception while he was preparing to serve and was serving his country. We urge everyone to follow along for more information as we get those new to the case caught up, discuss the case and bring forth more facts.